31 December 2007Ladies and Gentlemen, as we bid 2007 goodbye, please, at long last, say hello to Helix macOS Engine 6.1pr1 (Preview Release 1). This release should work reasonably well for most collections. But for some it will not work at all. This release is fully compatible with Helix 6.0.x, so you can switch back if it doesn’t work for you. This release is not a finished product! It will be followed, during the coming weeks and months, by subsequent Preview Editions as bugs are fixed and dormant features are revived and reactivated. If you encounter problems, we need to know about them. We’ve set up a new reporting section of our techdb for this purpose. Power Query: The queries function correctly, but you can’t alter them using the Preview Release. Document Management: Existing documents can be previewed with the Picture tile and stats can be extracted with the document stat tiles, but you can’t add, delete, or modify the documents themselves. Printing: Although printing does work, the output is very low resolution. 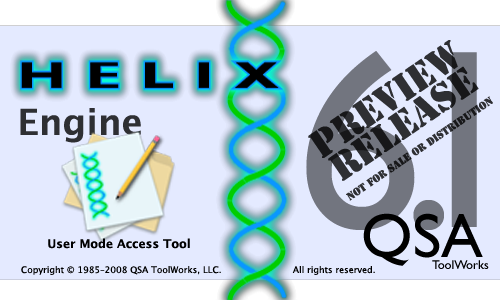 If you own a Helix RADE 6.x product, you have been promised access to the macOS native Engine. As our last edition of The Latest Word pointed out, your collection must have at least one User icon set up for User Mode access. For those of you who are unfamiliar with User Mode, we’ve revised that article to include a video showing how easy it is to create custom user menus in Helix. One of the most important things we’ve done with this Preview Release is that we worked to make sure it is 100% code-compatible with the Classic Helix 6.x products. That means that you can freely switch back and forth between running your collections in your Classic Helix 6.x applications and this new macOS native Helix Engine. But that only extends back to Helix 6.0: once you have upgraded to Helix 6.x, you can’t go back to 5.3.2 or earlier. Helix 6.0 has been available for two years now, and it has proven itself to many of our customers. If you haven’t upgraded yet, now is the time! Of course, as you begin your adventure into macOS, we need to remind you: make frequent backups and use both Helix Utility and Update Collection frequently to ensure the integrity of your collections! This Preview Release is available immediately. We’ve set up a Preview Release section where you can read about and download it. Helix customers who have participated in HelixChat (as well as our beta testers) are already familiar with the ability to create an ‘access password’ that lets you work directly in our own Helix customer database. We recently brought our improved bug reporting system online, so as you begin using Helix Engine 6.1pr1, we’d like you to use that access to report bugs to us. If you don’t already have such access, instructions for logging into our system can be found in the aforementioned Preview Release section. To improve security for our customers we recently changed our web store log in procedure. If you have previously registered in our database and created an access password you are now required to use that password to log in to your account. If you have never created an Access Password for your account, you can also log in using your Last Name, full Company Name, or email address. (However, partial matches no longer work.) Once you have logged in you can add or change your access password on the Customer Record: Update page. A look back through the 54 previous editions of The Latest Word reveals that doing something at the last possible minute seems to be sort of a modus operandi for us. We never intended for it to take until tonight, but we did desperately want to get it out there before the calendar flipped over. The rest of the work that needs to be done to properly complete the Engine and get the new Client out there is in progress and the next objective over and beyond those hills — getting RADE into macOS — is the last one before we get back to the real ‘fun’ part of Helix. We’re hoping 2008 will bring us crashing through that ‘fun barrier.’ Until then, from the Helix Recovery Team, please have a very happy and healthy New Year. *This is what you missed if you were out partying on New Year’s Eve. We tried hard to get this in your hands that night, but fate intervened in a hundred little ways.